The concept begins with a lesson I need to tack on to the four we learned from Solar Crowdfunding: Energy Efficiency leads to 'Skinnier' Grids that cost less. Let's start on the demand side. Two of the most pressing basic needs the poor have are for lighting and mobile phone charging (the latter coming from an unprecedented number of unelectrified mobile phone users - an enormous market opportunity). Serving those needs with yesterday's technology (the incandescent bulb and even CFLs) is very tough. So tough it has basically meant the economics to serve these markets with clean energy didn't work. Enter the LED. Advances in LED white lighting have revolutionized the amount of power poor households now need. That changes everything from component to system size which has cut costs dramatically. For example, the light supplied by 100W of incandescent bulbs can now be met with just 5W of well designed LED lighting. Since a phone charger takes similar power, we can now provide basic services with 90% less power. That's a story many may know. 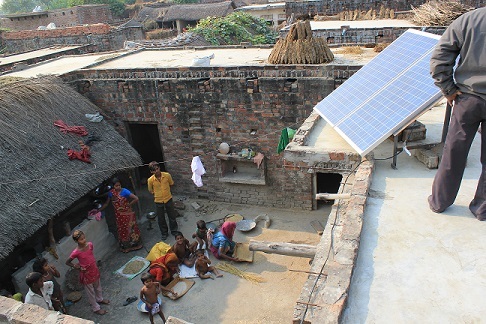 What is far less explored is the impact beyond the individual solar home system. That's because the drop in demand lowers the current in the "poles and wires" that connect households in conventional grids. This enables companies to use much thinner and cheaper wiring. Combined with smaller poles and longer spans, or locally dug underground trenches, the cost per household for reticulated wiring can be vastly reduced via thin-cable designs not previously imagined - our aptly named Skinny Grids. Combine this with innovative 1-2kV transformers that take this lower power and current as core to their design (like those promoted by Micro Former) and Skinny Grids could reach households 5-10km from power sources quite cost-effectively. That means they could service many hundreds of households if we ran them from existing off-grid sources of power (think Tower Power) or from the edge of the grid. Think about that for a minute. All the handwringing about the massive energy investments and grid expansion that's needed to electrify the world (a big driver in the Power Africa initiative and the related fight over the Overseas Private Investment Corporation's GHG cap) may be obviated (at least in part) by existing power sources that just haven't been tapped. All of that thanks to the LED light bulb (Michelle Bachmann eat your heart out ). At the end of the day Skinny Grids are just one of the many innovations coming from the off-grid sector. Many of the entrepreneurs believe that their innovations will boomerang to traditional grids in developed and developing country markets. Skinny grids seem closest to fitting that prediction given that fact that the LED is to the off grid market what the CFL is to those in the on-grid market. It looks like Par Almqvist of OMC may be right: the future for highly innovative clean energy deployment is off the grid.